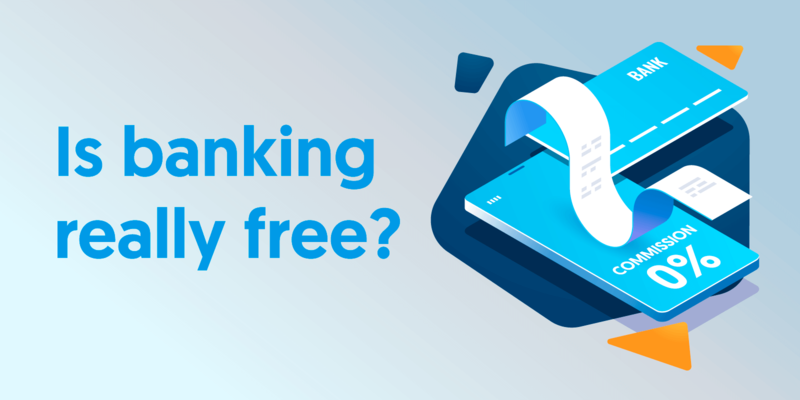 Is banking really free? And if so how do banks make money? On the whole, bank services are free in the UK. Certainly when you open an account you won’t pay for a card or welcome pack, or anything else you need to get started. Same with signing up online, via an app or in branch. If anything, you’re more likely to be given money to open an account or switch bank than have to fork out money yourself. You might even be thrown a small overdraft too. Again, often at no cost. In fact if you run a regular payment or current account and keep it in good order, there’s a fair chance you’ll never encounter a single fee in your life. So what are commissions, fees and charges, and when do they apply? Is it a case of digging through the small print? And surely charges are integral to a bank making money, aren’t they? So where are they? Commission is the rather vague, ‘catch all‘ term used by banks and other financial institutions to describe a set or range of fees for some of the services they provide. Basically, they can charge for what they like. But it has to add value right? Otherwise no one would pay. Typically, people are happy to pay for premium services, like packages with mobile phone insurance and loyalty points, air miles or gym discounts. But banks of all shapes and sizes carry charges, commission and fees, so it’s a good idea to understand where you might find them. Because some are trickier than others to spot. In order to understand commission, we first need to understand how bank fees and charges work. Overdraft fees you go overdrawn, you are likely to be charged a daily fee with some banks charging an annual interest rate on top. Overdraft fees can pile up quickly. So always agree an amount with your bank or building society; otherwise it will cost you much more. If you’re straying near to your limit, contact your bank right as soon as possible. Fees for going over an (unauthorised) overdraft you go over your arranged overdraft limit you might be charged for every cash withdrawal or cheque or card payment you make, even if the bank doesn’t allow the payment to go through. You might also be charged for refused Direct Debits and standing orders. Using a cash machine with your debit card is usually free, but some small shops, petrol stations and bars, for example can charge up to £5 each time you withdraw money from them. They’ll tell you about the charges on screen before you take out the cash so that you can decide if you want to go ahead or not. Using a credit card to take out cash comes with a charge, and you pay interest from the date you withdraw the money – interest-free periods only apply to purchases. prepaid cards charge you a fee to withdraw money from cashpoint machines. You may also receive a currency conversion charge. This depends on your bank, or card type – some are set up to be more favourable than others when you’re travelling. Many same-day bank transfers are free using the Faster Payment Service (FPS). most banks, you have to use CHAPS and pay a fee if you want to transfer very large amounts into an account the same day. If a Direct Debit or standing order is due to be paid but you don’t have enough money in your account, the bank can refuse the payment and pass on a charge. In fact the majority of current accounts charge for refusals. That’s why it’s often useful to have a second bank account - one with fast payments - so you can proactively troubleshoot when money is tight and make a transfer. Most banks have a list of charges for one-off items. They can do. So keep an eye out. Your bank will advertise their fees to you when you open an account. If there’s any change to the fees or terms and conditions of running your current or payment account, they have to tell you well in advance – usually two months. This doesn’t necessarily apply to all saving accounts or overdraft changes, however. So how do banks make money? Banks need to earn money from commissions charges and fees in order to stay afloat; and they do it in two ways. You shouldn’t be charged any interest if you keep your account in credit. However, if you borrow money, usually as a loan or overdraft, your bank may charge you interest. This will be included on your statement as a deduction, labelled as “interest”. Your bank should tell you in advance what the rate of interest is and it will be published online or in-branch. Interest is usually charged as a percentage of the amount you are loaned or are overdrawn. This will then be calculated according to the number of days before you pay the money back. For certain services, you may be charged a commission or fee. Any charges should be clearly stated and you should be told you’re going to be subject to them. Once charged, they will also all be listed on your bank statement. For certain types of account, you might be charged a regular management fee, or you could be charged a one-off fee for sorting out an overdraft or a transaction charge- say if you were transferring money to a friend abroad or changing currency while on holiday. These charges are passed on because a bank has used a third party service provider. Say you got a loan or overdraft from your bank, the bank may use a third party company to analyse whether you will be able to repay the amount. To do that they will check your past credit records. Some banks, like ours use interchange fees. A card service provider like MasterCard® or Visa charges a merchant to clear their business transactions. As a card service provider for MasterCard®, Amaiz makes money by getting a portion or split of that transaction fee. So it’s good for us when cardholders use their cards. How do bank commissions and charges affect me? If you want to take advantage of the full range of bank services, you might have to pay. Your bank should tell you the charges before you ever get them. The Banking Code states that banks must “pre-notify” customers of charges, giving you 14-days advance notice of interest or charges. Remember that because a bank manages your account, it can directly debit interest, fees or charges from that account. It won’t send you an invoice - it will just withdraw the money, so be sure to check every now and again to see if you’ve been stung unexpectedly. If you feel that what you’ve been charged isn’t accurate, contact your bank and get them to explain their charging process. If you feel their charges are too high, it might be time to consider moving to a cheaper alternative. Bank commissions and fees are not out to trap you. Most of the services that a bank provides will be free and they should also be very transparent when communicating their fee structure. We’ll come back to free bank services in a future blog post. If you think that what you’re being charged is too high, the good news is that there are lots of cheap alternatives cropping up in the retail banking space.